This is the perfect gift for the beer lover in your life. 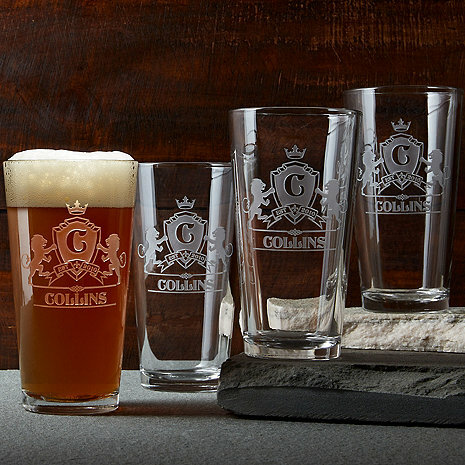 What better way to enjoy a favorite brew than in a personalized pint glass. This glass set features a deeply etched personalization, up to 14 characters plus year and single initial. Dishwasher safe. **"Est." IS automatically included on the mug. Is the family crest the actual one for the name or is it generic? BEST ANSWER: The design on the glass with the lions and shield are standard. the only thing that changes is the Last name, initial and year that you provide to be personalized. They are substantial and really pretty! Hope that helps. It was a year ago but I believe it was generic. I bought them as a gift and they were very happy. As a gift it made me look good. This is a generic crest. You can have one engraved with the actual crest but it is quite costly. The Personalized Family Crest Beer Glasses (Set of 4) crest is a generic one. Generic. The set is so nice. My son loves it. It’s just as shown in the photo, generic. Very impressive and high quality etching. Makes a nice gift! I purchased these as a wedding gift for craft beer lovers. The design was perfect especially since it was able to be personalized with their family name and year of marriage. The glasses were more substantial than I expected. They shipped super fast, (I swear it was within 2 days of the order!) I was so pleased I ordered another set as a gift as well. My only worry is how long the etching will last, which of course only time will tell. I hope so because these really attractive glasses!